2. Launch "Command Prompt", enter "ServerManagercmd -i FS-DFS"
3. Repeat step 2 for all domain controllers. 1. 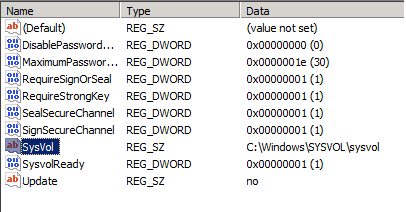 Still in the Command Prompt of the Domain Controller, enter "dfsrmig /setGlobalState 1". Remark: If one of the domain controller doesn't change Prepared state, you must not perform next step. Remark: "dfsrdiag /pollad" is used to triggering a sync with the global information store in Active Directory Domain Services. 3. 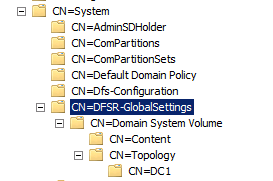 Launch "ADSI Edit", expand "Default naming context > <Domain name> > CN=System > CN=DFSR-GlobalSettings"
Remark: Local State 1 is Prepared State. 6. In "Windows" folder,﻿ a new "SYSVOL_DFSR" folder is created, and contains all copied domain public files. Before migrating to the "Redirected" state, a couple of precautions are advised. A. All domain controllers are in "Prepared" state. B. Verify that SYSVOL share is still being shared out. 2. Launch "Command Prompt", enter "dfsrmig /setGlobalState 2". ﻿4. Back to "Registry Editor", verify the "Local State" and the "SYSVOL" location. Remember that the migration process to the "Eliminated" state cannot be reverted under any circumstances. Before migrating to the "Elminated" state, a couple of precautions are advised. A. All domain controllers are in "Redirected" state. B. Verify that the SYSVOL share is still being shared out. 1. Still in the Domain Controller, back to "Command Prompt". 2. Enter "dfsrmig /setGlobalState 3". As a result, SYSVOL folder migrates to SYSVOL_DFSR. Now, SYSVOL folder is used DFS to replicate the contains. You can custom the ﻿replication schedule of the SYSVOL_DFSR folder. Thanks for posting. I REALLY liked this 2-part guide!